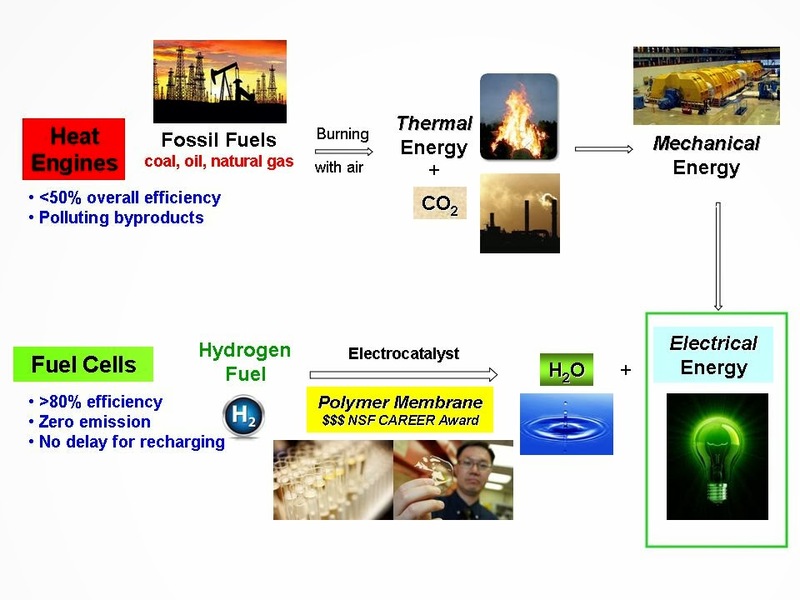 While conventional heat engine burns fossil fuels and generates electrical energy after multiple energy conversion processes, fuel cells convert energy stored in fuels directly to electrical energy with high efficiency without generating polluting byproducts. Among fuel cell components, polymer membrane plays a key role in the performance of fuel cells. Credit: Chulsung Bae, Rensselaer Polytechnic Institute. Fuel cells convert chemical energy stored in fuel into electricity without combustion. They hold great promise as a clean energy alternative to fossil fuels because they use mostly hydrogen gas, and their only byproducts are heat and water, which makes them pollution free. They also have more than two times the efficiency of traditional combustion technologies. But they still are expensive, with parts that can degrade over time, and to be widely used in ground transportation, for example likely would require an overhaul of the nation's infrastructure, among other things, in order to make the switch from gas to hydrogen. Chulsung Bae is working to develop a key fuel cell component that he hopes will be more durable and efficient than what is currently available, as well as less costly, with the hope of promoting more widespread use of the technology. The National Science Foundation (NSF)-funded scientist and associate professor of chemistry and chemical biology at the New York State Center for Polymer Synthesis, Rensselaer Polytechnic Institute, predicts that fuel cells ultimately "will be adopted in ground transportation in automobiles, and they will probably replace batteries in such devices as laptops and cell phones." The fuel cell was invented in 1839 by William Robert Grove, a Welsh scientist, but was not used commercially until the 1960s, according to the Department of Energy. NASA used fuel cells in Project Gemini between 1962 and 1966 to generate power for probes, satellites and space capsules, and still uses them in the space program. Astronauts, in fact, drink water generated from fuel cells, Bae says. Like batteries, fuel cells have no internal moving parts. Unlike batteries, however, which need a long time to store energy, fuel cells produce electricity instantly and continuously as long as fuel and air are available. When hydrogen is the fuel, "electrons are drawn from the fuel at the negative side (called anode) of fuel cell and travel to the positive side (called cathode) through external circuit, turning chemical energy into electricity while producing only water and heat as byproducts. Fuel cells have the potential to revolutionize energy if scientists can make them more affordable and durable. "It's a complicated technology made of many parts, with two being the most important," Bae says. "These are a catalyst, which converts the fuel to proton and electron by electrochemical reaction, and the other key component of the cell is a membrane that allows the proton to move from the anode to the cathode of the fuel cell to complete the chemical reaction. The proton is known as H+, which is a positive form of the hydrogen created by removing one electron from the hydrogen atom." Bae's goal is to develop a new membrane through molecular engineering that lasts longer and is more economical than the only commercial product currently available, a material called Nafion, which has serious drawbacks in addition to its high cost, he says. These include the "rare availability of fluorine-containing precursors," that is, the materials need to produce Nafion, which are difficult to make, "and reduced proton conductivity above 100 Celsius degree," among others, he says. "It is not ideal for fuel cells." "If you want to increase the performance of fuel cells, proton conductivity is the key for determining performance," he adds. To that end, Bae has been studying Nafion to determine which chemical structures in it are weak so "I can revise them in my design of new membrane chemical structures," he says, and has synthesized a new type of fuel cell membranes in the lab. In testing, "we make a membrane and, for example, say it is made of five different chemical structures a, b, c, d, e," he says. "I change 'a' and measure its properties, then change 'b' and measure its properties, and so on. I would like to know what happens to the properties when changing the structure systematically, so I can have a better understanding of the relationship between the chemical structure and its performance in fuel cells." He has a candidate membrane and is collaborating with the Los Alamos National Laboratory to test it. "In our lab we discovered key structures that can enhance proton conductivity without adding too much cost by using commercially available plastics as a membrane precursor, changing its structures and measuring its properties," he says. As part of the grant's educational component, Bae teaches about clean energy technology in his graduate and undergraduate courses, and has sponsored high school students for a month's internship in his lab. "I usually teach organic chemistry, a large enrollment undergraduate course with 200 or more students," he says. "They mostly are juniors and sophomores who often think that chemistry is just about the periodic table, and not related to real life. They don't get the idea of how chemists can have an impact on our lives. I give them fuel cell demonstrations and talk about our membrane work in order to show how chemistry they learned in the class can change the world and chemistry is an important part of our lives."